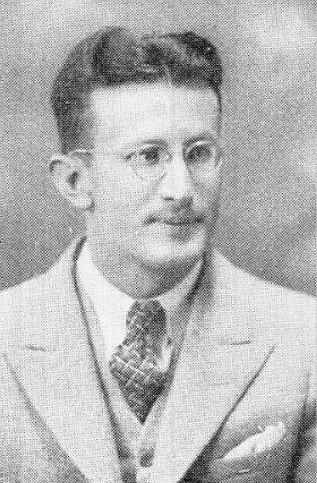 Alfred D. Weir (1909-1996) was the son of A. F. Weir, the successful retail furniture merchant who founded Weir Furniture in 1922. The younger Weir graduated from SMU in 1933 with a degree in mechanical engineering and started his career, fresh out of college, at Dallas’ Ford assembly plant. 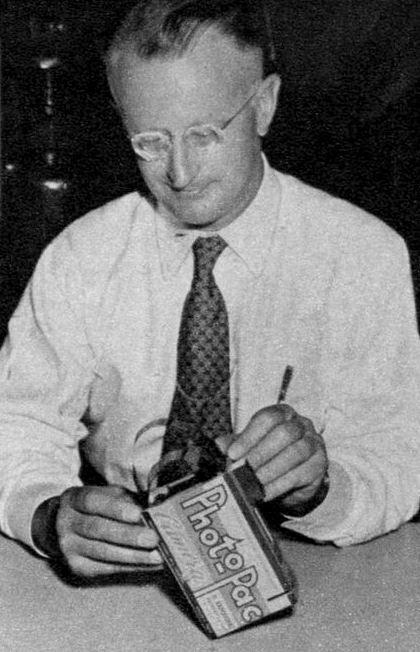 During World War II, he was the chief industrial engineer at North American Aviation and was later employed by Fairchild Engine and Aircraft, Ford’s aircraft division in Kansas City, Texas Instruments, and Bell Helicopter. 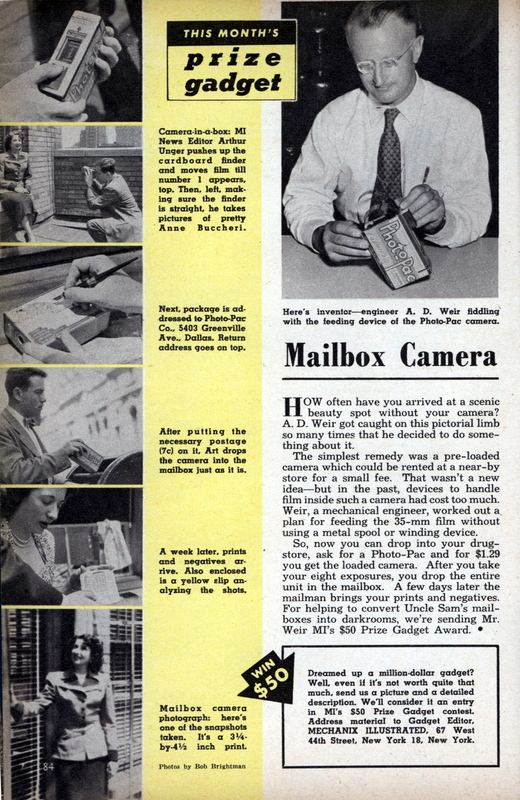 After the war and before his time in Kansas City, Weir took time out from his engineering career to try his hand as an entrepreneur: he invented, patented, and manufactured the Photo-Pac, a single-use camera made of inexpensive fiber board and pre-loaded with 35mm film (loaded by blind employees in total darkness). 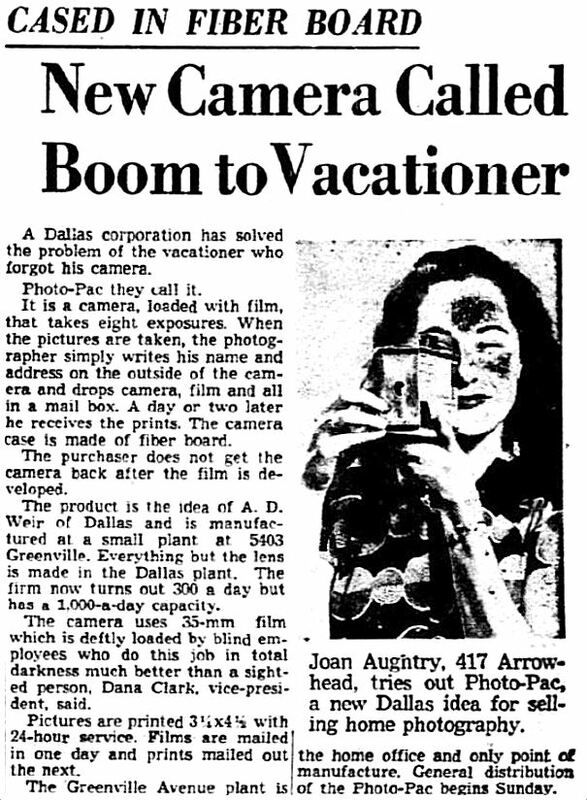 The user would buy one of these cameras at a drug store, department store, or gas station for $1.29, take eight photographs, and then write his or her name on the side of the camera and drop the whole thing — with the film still inside the camera — in a mail box. 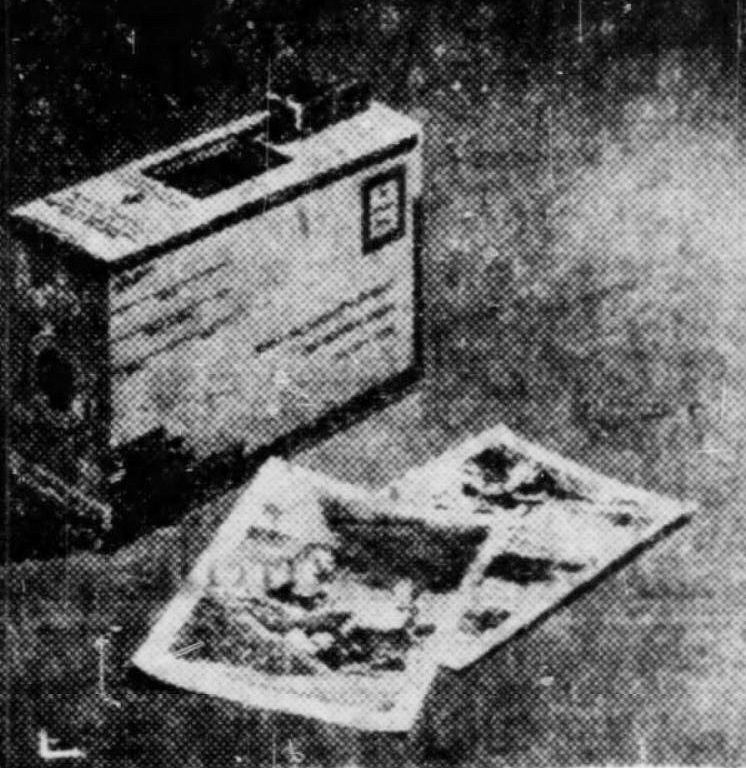 Photos would be processed in Dallas, and prints and negatives would be returned to the customer in a couple of days. The camera would not be returned. 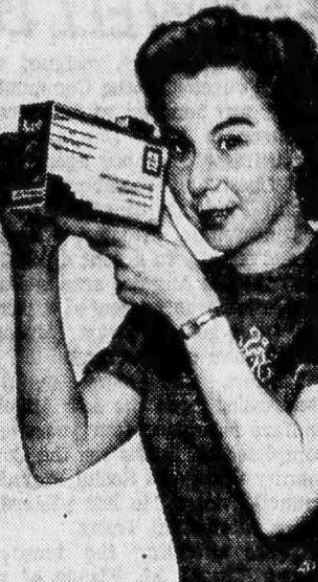 It appears to have made its debut at the 1948 State Fair of Texas at an introductory price of only 98¢ (click for larger image). 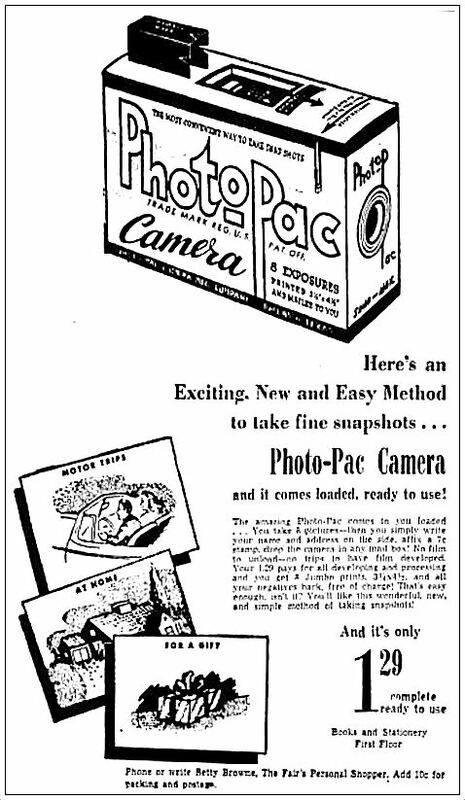 The camera won a “prize gadget” award from Mechanix Illustrated (click to see very large image). By the summer of 1950, the number of exposures went from eight to twelve, and the price increased to $1.49. 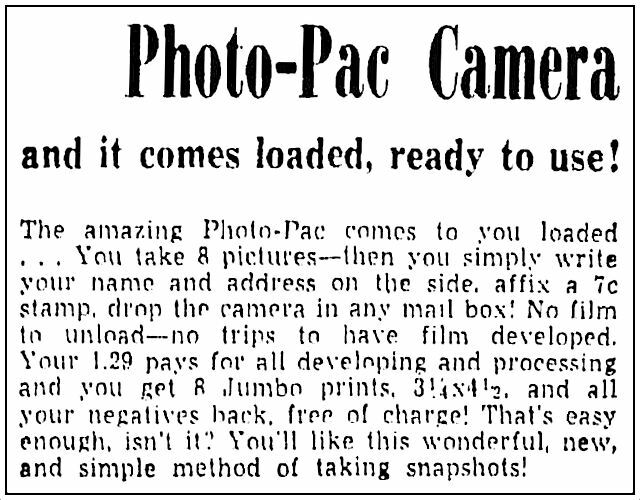 It seemed that the business was growing, but by the fall of 1950, Photo-Pac seems to have reached the end of the road. 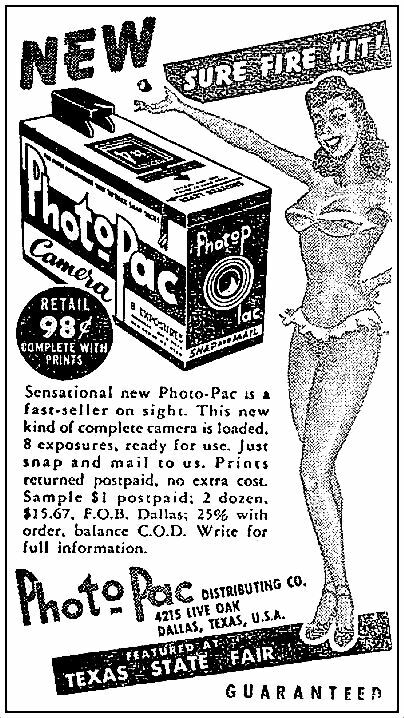 Court dockets showed a couple of lawsuits filed against the company Newspaper ads showed stock of the cameras being deep-discounted to as low as 50¢ apiece. The next year, 1951, saw Weir returning to his engineering career — he accepted a position with Ford in Kansas City and apparently left his business dreams behind. It was a great idea, but, for whatever reason, it never fully caught on. 36 long years after A. D. Weir’s Dallas company folded, Fuji introduced their very popular disposable camera; Kodak followed with theirs in 1987. Those things were everywhere — everyone’s had one of them at one time or another. I bet A. D. Weir was miffed. Top photo is an inset from the Mechanix Illustrated “prize gadget” page, from the blog Modern Mechanix, here. Weir’s patent can be found on Google here. 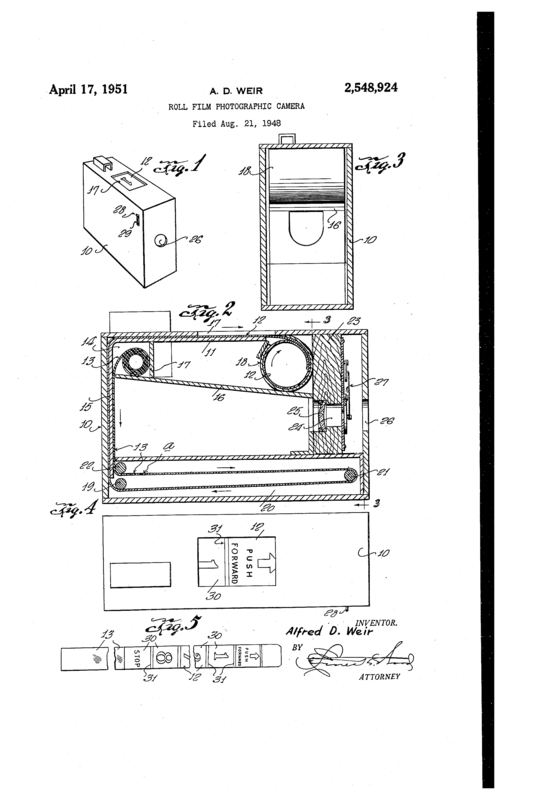 To view Google Patent Image separately (and really big), click image below. There seems to be some debate about whether Weir’s Photo-Pac was actually the first single-use disposable camera — if it isn’t strictly the first, it seems to have been the one that made the most headway into the American marketplace. A great article on the topic can be found on the Disposable America website here. Wikipedia’s “disposable camera” page is here. 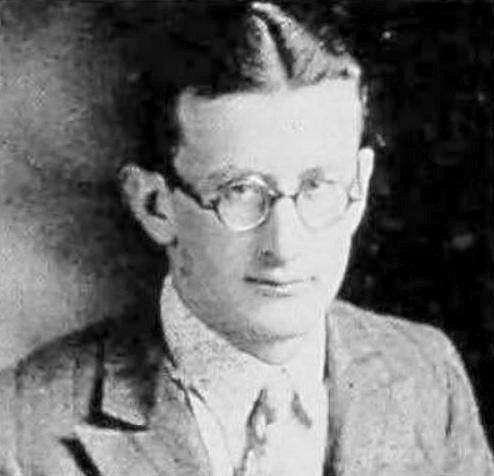 A. D. Weir’s father, Alfred Folsom (A. F.) Weir opened Weir Furniture at 2550 Elm Street in 1922; in 1934 the company was incorporated to include his wife and son. A. F. Weir sold the Dallas company to his brother Earl (who had owned furniture stores in Fort Worth and Arlington) in the 1940s — that business closed sometime between 1945 and 1948. In 1948, Earl’s son John Ray Weir opened Weir’s Furniture Village on Knox Street, a business still going strong today. Most images are magically larger when clicked! I am a 23 year old member of the Weir family (A.E. Weir was my great, great grandfather). I had no idea this was part of our family’s heritage.. wow! Do you have any idea when the Weir clan got to TX?